Learn about entrepreneurship, making positive choices, the law of attraction, life skills & much more. 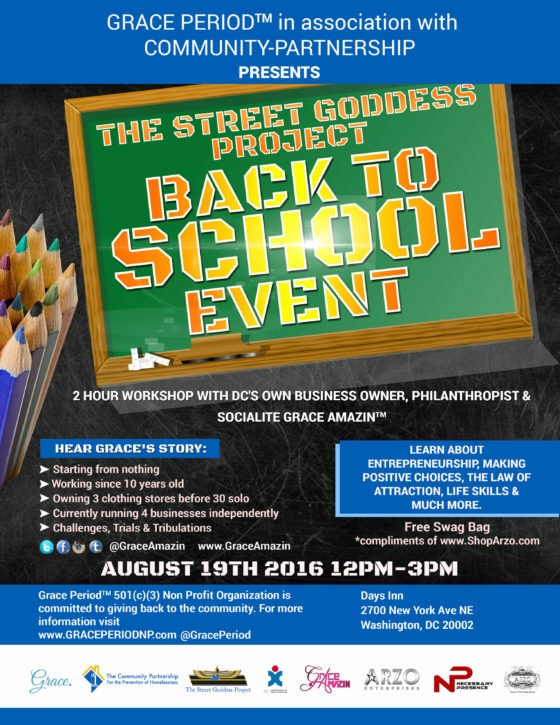 Grace Period 501(c)(3) Non Profit Organization is committed to giving back to the community. For more information visit www.GRACEPERIODNP.com @GracePeriod. *The Community Partnership is an independent, non-profit corporation that coordinates the District of Columbia’s Continuum of Care on behalf of the city. Through the work of our providers, the D.C. Continuum of Care includes prevention services, street outreach efforts, emergency shelter, transitional housing and permanent supportive housing for individuals and families. Their mission is to serve as a focal point for efforts to reduce and ultimately prevent homelessness in the District of Columbia.